Keeping tabs on the TV remote control has been one of the greatest problems to plague man over the last 50 years. Apple Watch is finally solving that issue by slapping all the TV controls you need right on your wrist. SamMote revealed today that its popular iPhone TV remote app now includes Apple Watch integration. The iPhone and Apple Watch don’t come with the infrared sensor you’d normally need to beam signals to your TV, so the app uses Wi-Fi to send commands instead. The Apple Watch TV remote is free, but only works on Samsung smart TVs made after 2011 (hence the name “Sam” in the app’s name). If you do have a Samsung TV you’ll now be able to flick through channels, boost the volume and navigate menus without having to dive through the couch cushions to find the clicker. That alone sounds like a fine reason to throw down for Jony Ive’s smartwatch. 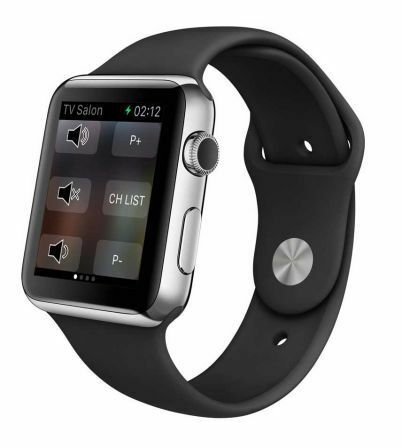 This entry was posted in Apps and tagged apple, Apple Watch, Apple Watch apps, remote controls, SamMote, TV. Bookmark the permalink. Apple just bought a forest 2.5 times the size of Manhattan.